Dr. Ehland is an oral and maxillofacial surgeon currently serving in the United States Air Force. Her practice currently includes dentoalveolar, dental implant, orthognathic, minor pathology, TMJ, trauma and cosmetic surgeries. She is also an AEGD-1 instructor in the OMS department and appointed as an Associate Professor in the Air Force Postgraduate Dental School. She has been on active duty for 8 years, with assignments at Sheppard AFB, TX, Travis AFB, CA, and Wright-Patterson AFB, OH. She attended Marquette University for an undergraduate degree in biomedical sciences followed by the University of Detroit Mercy School of Dentistry for her Doctor of Dental Surgery degree. She completed an AEGD-1 residency at Sheppard AFB, TX in 2011. Most recently, in 2016, she earned her certificate in oral and maxillofacial surgery after completing residency training at David Grant Medical Center, Travis AFB, CA. She is board certified Surgeon and is the current Georgia Oral and Facial Surgery Fellow in Facial Cosmetic and Reconstructive Surgery. This additional year of post residency training accredited by the American Academy of Cosmetic Surgery (AACS) is designed to enhance her skills in specialized aspects of Maxillofacial Surgery including Cosmetics (Facial Plastics and Hair restoration), Microneurosurgery (Nerve Repair), and Reconstructive Jaw Surgery (Orthognathics and Pathologic Reconstruction). 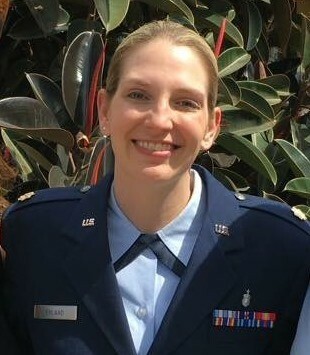 Dr. Ehland is married to Haris Ehland, who is also active duty Air Force. In her spare time, she enjoys traveling with her husband, visiting family in Michigan, playing golf and volleyball, hiking, cooking, and reading.